Bariatric Girl » Blog Archive » Thriving! Triumph over Trauma is a must buy! Next Article« Thank you Lisa Lampanelli!! Thriving! Triumph over Trauma is a must buy! I have just returned from an incredibly motivating event in Las Vegas for WLSFA.org. We had over 500 people in attendance and when I have time to gather my thoughts I will share about the event and include links to pictures. In the meantime I want to share with you about a book that is a MUST read! If you’ve ever felt alone regarding how it felt to be obese….. you will no longer feel that way. Incredible stories written by weight loss surgery patients! 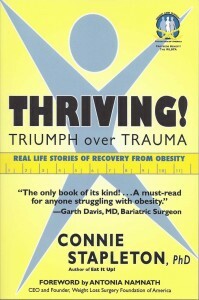 Dr. Connie Stapleton, PhD wrote the book and compiled the stories and included some WLS bloggers as well. She helps you understand more about our disease and how to work a journey that moves you toward the optimum outcome. My wish is for bariatric professionals everywhere to read about us and our disease. If you buy the book, part of the proceeds go to WLSFA.org. For those who no longer read paper books you can purchase it on Amazon for your Kindle. It helps WLSFA if you purchase the actual book. For those that are unfamiliar with WLSFA.org it is a non-profit organization that helps cover weight loss surgery for many who have been denied. The 7th grant recipient was just announced. No other organization has granted seven surgeries! The excitement I feel about this book is impossible to explain. This is the world I have lived in for the last ten years and as much as I try to share these experiences with our bariatric professionals….I feel like I have failed miserably. Sometimes I feel like I can’t possibly share how “not alone” many people are that write me. Now I have a way to easily share. This book is for the WLS pre-op, WLS post-op, family of the obese, anyone that truly wants to understand obesity and the professionals that treat us. Thank you Connie Stapleton and thank you WLSFA.org for making this possible! !